Since the first winter storm hit Boston at the end of January, the city has removed over 10,000 truckloads of snow after a record six feet of snowfall in the last 30 days — breaking the previous record of 58.5 inches, set in 1978. Liberty Mutual could not share the number of claims they received as a result of the winter storms but Glenn Greenberg, director of media relations at the insurer, said the company assigned dozens of claims adjusters in the field to assist customers. Some adjusters came in from other parts of the country to help expedite the claims process, he said, adding that the insurer had several more adjusters ready to come to the region should claims volume increase. “The majority of these claims are water damage from ice dams and, to a lesser extent, collapses,” said Greenberg. 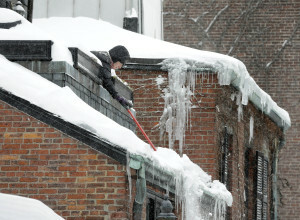 Boston Public Works Department (PWD) crews have continued to work around the clock to remove the record amount of snow. According to the Mayor’s Office, the snowiest month-long period on record has kept the PWD busy — 244,064 miles of roadway have been plowed in 136,652 hours and 70,051 tons of salt has been used. Reportedly, 6,000 of the 10,000 truckloads of snow have been melted to increase capacity at the city’s snow farms. The Tide Street site has been melted to 50 percent capacity, while the Reservation Road site is at 10 percent capacity. The total cost of the snow response to the storms in the last couple of weeks has been estimated at $30 million. According to the Mayor’s Office, the city’s annual budget for snow removal is $18.5 million. Two more storms headed to the region this weekend are expected to add another foot or more of snow. Total economic damages and losses as a result of U.S. winter storms during the month of January, according to Impact Forecasting, Aon Benfield’s catastrophe modeling division, were estimated at $500 million. Winter storms caused an estimated $2.3 billion in insured losses in the U.S. in 2014, up from $1.9 billion in 2013, according to Munich Re. From 1994 to 2013 winter storms resulted in about $27 billion in U.S. insured catastrophe losses (in 2013 dollars), or more than $1 billion a year on average, according to Property Claim Services (PCS) and the Insurance Information Institute Inc.
Deland, Gibson Insurance Associates, an independent insurance agency in Wellesley Hills, Massachusetts, said the agency has seen a noticeable uptick in claims. “We get two or three claims a week on average, and now we’ve seen 30-plus claims this week so far, so it’s a 10-times increase,” the agency’s vice president Tom Skelly said Thursday. Skelly said most of the claims are property damages related to ice dams. In addition, his agency has also received a couple of claims for roof collapses due to snow and ice. On the higher end, some damages related to ice dams could cost tens of thousands of dollars, he said, while on the lower end, some damages won’t cost much at all. During the past month in Boston, “due to the accumulation of snow and then a break in the snow, and then more snow, and another break, and then another storm. We’ve got three major snowstorms of over a foot of snow at peak and those all contributed to the buildup of ice dams,” said Skelly. While the majority of these claims are roofs and ice dams, there have also been a number of fender bender claims, he said. “The roadways are a lot narrower because of the snow and the snow piles are a lot bigger so it’s more difficult to see around the corners, so people are getting into little fender benders as well,” said Skelly. There is more snow coming, probably another foot in the Boston area, he noted. “Our recommendation is, clean the gutter systems up and clean everything up as quickly as you can before this next system goes through. Clear the snow and ice from the roof. Remove the snow from the roof with a roof rake, get as much weight off as possible, and let the roof shingles get exposed to the sun which will help melt the ice as well,” said Skelly. Kaplansky Insurance Agency, a Needham, Massachusetts-based independent agency with 11 offices in the region, is also fielding ice dam-related claims. “We’ve been getting quite a few claims and claims inquiries on ice dams — there are quite a few — where water is leaking into people’s houses. That’s mostly the claims we are getting. We are seeing an increase in ice dam claims compared to past winters,” said Scott Barudin, vice president of business development at Kaplansky Insurance. The Arbella Insurance Group, a regional property/casualty insurance company based in Quincy, Massachusetts, said its claim volume for the month of February looks to rise significantly compared to a year ago. “If we look at our February 2015 versus February 2014, we are on track to be well more than double what we saw in February 2014 from a claim volume perspective,” said Joe Salerno, vice president of claims at the Arbella Insurance Group. “We are seeing a spike in the total claim volume including an increase in our auto claims as well as a significant increase in our property claim volume, driven by a high percentage of ice dam claims,” said Salerno. Salerno said ice dam claims right now easily represent 40 to 50 percent of the new claim volume that the company is seeing. “And we expect that we will continue to see ice dam claims come through the door at a high frequency as all of this snow begins to melt,” he said.